Many, many congratulations to Becki and Adam, who were married in a beautiful church service then celebrated with their family and friends at Stapleford Abbotts Golf Club. 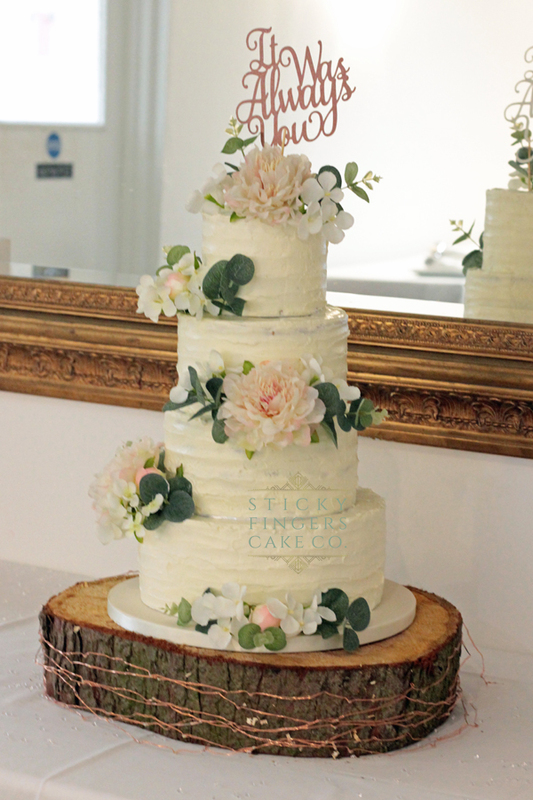 Their four tier wedding cake was covered in luxurious Swiss Meringue Buttercream (as requested by the Bride! ), decorated in artificial peonies and displayed on a rustic log stand. An amazing choice of flavours; Strawberry and Champagne, Chocolate and Nutella (another request from the bride! ), Victoria Sponge and Traditional Lemon. Hope you had the best of days and wish you both a lifetime of happiness!